Sister Mary Elizabeth Looby grew up in Ogdensburg, New York, where she met the Grey Nuns of the Sacred Heart. 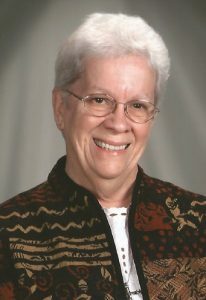 She has ministered in elementary school as a teacher and as principal at Grey Nun Academy and Melrose Academy. She also served on the staff of Bon Secours Spiritual Center as spiritual director and program director and continues to direct retreats and do spiritual direction. Many of the years of her religious life have been in ministry with the Grey Nuns as formation director, Director of Associates and as member of the Leadership team of the Grey Nuns. Prior to assuming her present position as a Leadership Council Member, she ministered as Pastoral Associate in the Catholic Parishes of Malone, New York. She presently serves as Secretary of the Grey Nuns of the Sacred Heart. She resides with other Grey Nuns at Holy Redeemer Lafayette. During these 50 years, I have learned that, contrary to what some may think, religious life is not an opportunity to escape life but rather an invitation to live life to its fullest. It requires the ability to give, grow and respond to the challenges of making the Gospel a reality in today’s world. It is a life worth considering for those who seek to serve God and others. I continue to love my life as a woman religious in the Church as a Grey Nun of the Sacred Heart. I entered the Grey Nuns because I saw them as happy people whose ministry matched what I felt that I could do. This life has been a good and rewarding choice for me. These fifty years have flown by for me. Congratulations cousin Mary. It is hard to believe it is 50 years. On behalf of the Davy clan in Canada I wish you all the best for many more years. Thanks, Bernie! I know what you mean, I can hardly believe that it has been 50 years! Give my love to the Davy cousins in Canada! Mary Liz, my dear friend, you are truly a beautiful person inside and out and I feel honored to be able to have shared part of your journey. I smile when I realize that for 50 yrs. you have served Our God in so many ways and I thank you for using your gifts and for touching so many lives with your gentleness and grace. Happy Jubilee! So glad will be able to celebrate with you. Congratulations Mary Elizabeth! Loved getting to know you in Malone. Thank you for your example as a women religious and for always encouraging our choice of life. It is a rewarding one! Congratulations! Hope you have many more happy years. Looking forward to seeing you again. I hope you have a lovely Birthday, then celebration on the 28th with your whole gang! Happy Anniversary of a wonderful filled life! Congratulations, Mary Liz! Thank you for the invite. I look forward to the 29th…AND…the 28th!